Turkey has reacted with anger after a Greek court ruled against extraditing eight Turkish soldiers accused of involvement in an attempted coup. Turkey accused Greece of failing in the "fight against terrorism" and said the decision was "politically motivated". The eight men fled in a helicopter to Greece after last July's coup attempt but say they were not involved. Turkey has demanded the three majors, three captains and two sergeant majors return to stand trial. The soldiers have argued their lives would be in danger. They are accused of playing a significant part in the coup attempt on 15 July 2016, and of having links with a group which allegedly tried to assassinate President Recep Tayyip Erdogan on the night of the attempted coup. "We protest this decision which prevents these individuals who have threatened the life of our president and took an active role in a coup attempt that killed 248 of our citizens... from appearing in front of Turkish judiciary," Turkey's foreign ministry said in a statement. In retaliation to the Greek Supreme Court's ruling, an Istanbul court has approved a request from prosecutors for an arrest warrant for the eight soldiers. Turkish-Greek relations have gone through very difficult phases in the past, but the general understanding was that those days were over. Now, relations between the two countries risk a dramatic turn for the worse. Ankara's heavy-handed response in contesting the Greek Supreme Court's ruling with the issuing of an arrest warrant is a clear accusation to Athens of a failure to co-operate in the arrests of Kurdish or ultra-leftist militants in the past - a general understanding shared by nationalists in Turkey. 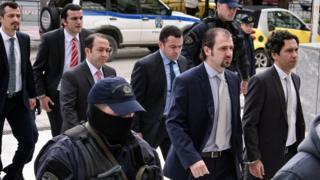 The extradition bid had become a source of tension between Ankara and Athens in the last few months. Several closed-door meetings reportedly took place between the two countries' foreign ministry officials but no solution could be reached. The case has presented a diplomatic dilemma for Greece and created new tensions between the two Nato allies. They have a complex relationship and are currently working together to help negotiate a peace deal in divided Cyprus. Greek Justice Minister Stavros Kontonis said before the verdict that he would respect the decision and not intervene. The eight soldiers in Greece have said that their relatives in Turkey have lost jobs and had their passports confiscated since they fled. Critics of Mr Erdogan say he has used the failed uprising as a way of removing his opponents and tightening his hold on power. The Turkish government says that it has taken legitimate action to root out "terrorist" groups that had infiltrated the state. Pro-government news outlets have branded the decision "a scandal" and accused Greece of "protecting the coup soldiers". Yeni Safak daily said Greece was taking the plotters under its wing and Aksam newspaper called the ruling "a historical disgrace"
A Haber TV report hinted at a diplomatic crisis, saying "the relationship between Turkey and Greece will change after this decision".